Owing to our competence in this realm, we are engaged in presenting top class collection of Silver Plated Lakshmi Ganesh. These idols are developed by employing futuristic technology together with optimum-class quality inputs. 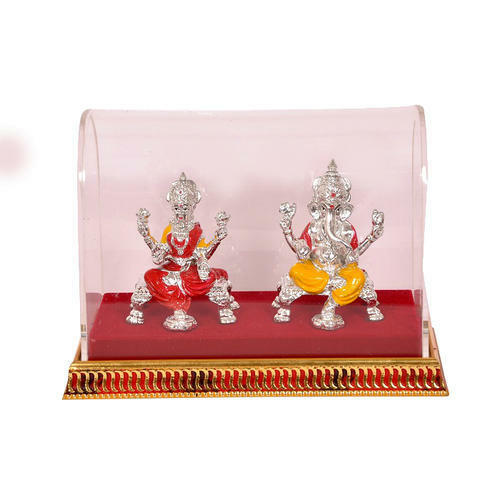 To uphold their superiority and reliability at our clients’ premises, these idols are sternly inspected before shipment and also deliver these in optimum class and tamper proof packaging. Founded in 2014, Elite Handicrafts is an eminent entity in the market, involved in wholesaling, supplying and trading of a comprehensive consignment of products comprising Handcrafted Silk Saree, Handcrafted Kitchenware, Handmade Ladies Dupattas, Handmade Puja Thali, Women Watch, Handmade Idols and Gift Hampers. Highly recognized and commended in the market owing to their best design, high performance and effectiveness, all these products are presented by us in standard and changed forms to our clients. Moreover, only optimal-class basic material is used in their fabrication of these products by our vendors.